Lauren is a native of Dallas, Texas and has lived in Birmingham for over 10 years. She is an Alabama licensed massage therapist, practicing in the Birmingham area since 2005. Lauren attended Red Mountain Institute for the Healing Arts in 2004 and received 750 hours of instruction for her massage therapy certification. Her skills include traditional Swedish (relaxation) massage, deep tissue, neuromuscular or trigger point therapy, Thai yoga massage, Manual Lymphatic Drainage, and both cosmetic and therapeutic Cupping. Lauren attended her first yoga class in Birmingham at Heartwood Yoga not long after relocating. 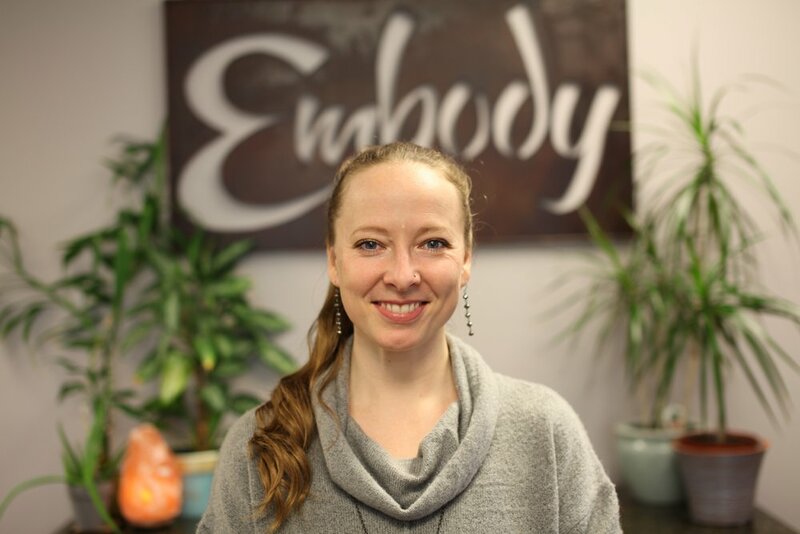 She attended regular classes there for years, graduated from Heartwood’s Yoga Teacher Training program in 2008, and became a registered yoga teacher at the 200 hour level with the Yoga Alliance (RYT200). Continuing her mentorship with co-owners John LeMunyon and Kate Tremblay, Lauren taught classes at Heartwood from 2008-2012, and has furthered her study with this ancient practice through Himalayan Institute senior instructors Rolf Sovik and Sandra Anderson. More recently this year, Lauren became a MovNat® Certified Trainer (Level 1), and is now teaching the practice of Natural Movement®. Her goal in leading yoga asana classes (traditional yoga postures) is to create a supportive space where one can skillfully experience embodiment: realizing the whole Self – physical body, energy, contents of the mind & emotions, and inner self-spirit-soul. Her classes have a certain gentle aspect to them, balanced with work to strengthen and lengthen the spine and limbs, including joint mobilization. All classes are generally appropriate for healthy beginners and those looking to have a movement-meditation experience. Lauren began her personal investigation of the practice of Restorative Yoga soon after she began her teaching career and knew she found an effective, accessible way to encourage wellness through this gentle, supportive posework. Naturally combining her experience as a manual therapist with the supportive, comforting role of Restorative Yoga instructor, Lauren’s been guiding others in their discovery of this nourishing practice for over 3 years. She offers 60 and 90 minute therapeutic massage sessions and private yoga instruction at EMBODY. Out-call services are also available for at home or office instruction and corporate events. For more information, visit LaurenRaeBrown.com and OrganicMovementBirmingham.com.